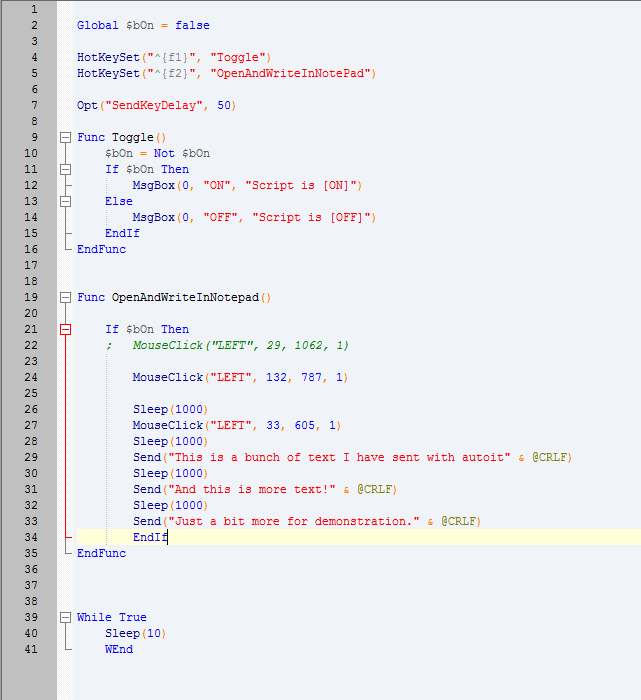 In this lesson, we will be learning the syntax of AutoIt and creating our first script. 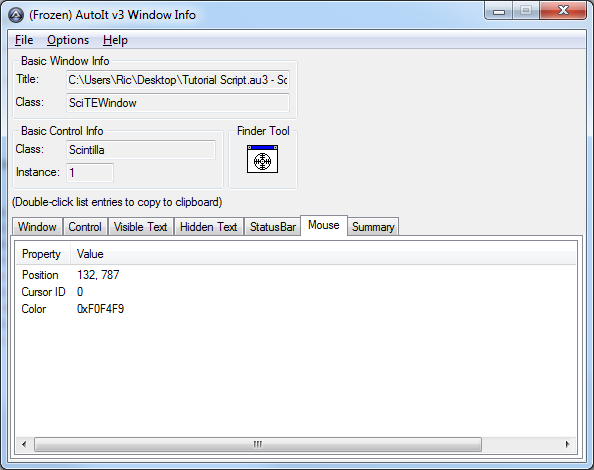 AutoIt is actually very similar to VB.NET, but it doesn't use dot notations, i.e, 'file.exists' would be 'fileexists'. AutoIt is based around user-like actions, such as, but not limited to, mouse clicks, audio playing window manipulation and much more, it is actually very powerful. To do this in other languages would require lots of code and would most likely over complicate things. AutoIt does a great job of simplifying things, so you can quickly make scripts instead of spending weeks on them. What we are doing here is checking While True Is True, which it must be and then sleeping the script for 10ms. Then we close the While with 'WEnd'. Because the 'True' never changes, this will always run. You can also use the number 1 instead of True, as 0 = False and 1 = True in programming. I use this in every script I have ever wrote, because I don't want it to close after doing the script. I want it to be remain active and 'listening' for my hotkey presses. The second thing you would likely want to do, is create some 'HotKeySets', Which is when a key has been pressed, you can tell the script to run a custom function, (that you must also create). In my scripts, I use a ini file and pass the user set key as the key instead. Rather than putting the actual key I want to test, I put the variable name that was read from the ini file. You can see here that I used Global $VaribleName and initialised it's value of string "^!f1", then passed the variable name into the hot key set instead. You can to use Global outside of the functions and when you think you will be using that variable in other functions. Local is used inside of functions, like a throwaway variable that is used to get something, but itself is not required for anything else or anything that's needed to be accessed by other functions. If you have understood most of those operators, we can continue on to making a basic script that will do a small sequence of tasks. In this demonstration I want to open Notepad and make it type something. There is far better and more reliable ways to do this, such as shellexecute and winactivate, but for demo purposes, I would like to show you through mouse moves. We will want it so we have toggle key, so that we can stop it from interfering with our normal computing routine when we don't want to use the script, but also have it listening for when we do want to use it. If you want to use actual buttons you must enclose them inside braces, if you don't, the script will think you mean the letter F and the number 1 instead. Remember, you must have the modifier, in my case the ^ outside of the braces, but inside the quotations. Now we can make our functions. I will make the toggle function first. In this function I set our Global boolean to NOT it's current value, which means I set it to the opposite of it current value. This way, every time we press that key it will set the value of the boolean the opposite of what it was. You cannot use $bOn = true as once it is true, it is true, it won't make it false when you press it again. Then we do a check with an if statement whether $bOn is true, when checking if true, you just do "if $bOn", you don't need to specify if it is true as that is what it assumes you are checking for by default. If checking if it is false, you would check like this: "if not $bOn". Then we use and 'Else' to Message Box that it is false if it isn't true. Close the if with EndIf and close the function with EndFunc. Now we can create the actual function that will do the mouse moves and typing. You can use the AU3Info on the Tools menu to get the mouse position you need. Head over to the 'Mouse' tab and use the finder tool by dragging it and dropping it on the element you want the mouse to click on to in our script. It will display to mouse position in the control below. Try to remember that number and type it into the 'MouseClick' Parameters. You can freeze it by going to Options > Freeze, if you aren't good at remembering numbers. Everything I do something I choose to sleep the script for one second (1000ms) just incase things may not have loaded quick enough. When I send the text I also concatenate (add on) this & @CRLF, which is basically and newline and means "Carriage Return Line Feed"
I do the same thing for all of the other actions and then close the if that checks the boolean state and then close the function. I also made an option to delay the send keys by 50ms so it looks more like human typing, by default it is set to 5ms which is very quick typing. Most languages will send without any delay, which makes it look like copy and paste. To return it to normal you would just do that again but make it 5ms instead of 50ms. Now all we have to is add our bit of code that will keep the script alive. Now this is the fun part, let's check if it works! To run the script go to Tools > Go (or press F5).